Another week has flown by. I get a three-day weekend and the weather is so nice here in Northern California that we are thinking of having a barbecue on Sunday. And since I live near Sacramento, we could go skiing in Tahoe on Saturday (60 minutes away) and have a barbecue outside the next day. I'm never moving. Now, whether I would be able to walk the day after skiing is an entirely different issue. 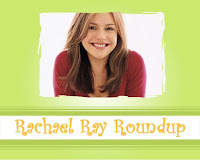 Here are the blog posts and news stories I found this week about Rachael Ray. If you write a post or run across a post that you think would fit well in the roundup, please feel free to e-mail me. Have a great weekend! Katerina at Daily Unadventures in Cooking gives us the details on how to clean your garbage disposal, which she learned from Rachael Ray. In a very funny post, Vicki of Living Life and Catching Light progresses from a skeptic to a true believer in Rachael Ray's recipes from Express Lane Meals. That Journalist includes Rachael Ray's You Won't Be Single for Long Vodka Cream Pasta as her recipe of the week. You can find the recipe for this dish in 30 Minute Meals 2 (my favorite Rachael Ray cookbook). The Desert Sun newspaper published a transcript of Rachael's interview with First Lady Laura Bush. Go read it - you might learn something! Jacob at Food Network Addict found pictures of Rachael's appearance on The Late Show with David Letterman. And, of course, he worked his usual magic on them. ECrush.com took a poll asking which daytime talk show host was most deserving of a big box of chocolates this Valentine's Day. 38% said Tyra Banks, Oprah came in with 25%, and Rachael Ray (16%) and Dr. Phil (11%) brought up the rear, but at least they were included! Bug n' Belle is back in the Roundup this week with an Express Lane Meals recipe extravaganza! She made Chicken with Scallion-Lime Sauce and Sweet Carrot Rice, Chicken Sausage and Egg Sammies, Road to Morocco Lamb with Pine Nut Couscous, and Crab and Corn Chowda-Mac. Go check out the results. How cute - Yardsalequeen has a picture of what the first cover of Rachael's first cookbook, 30 Minute Meals, looked like. Just Jared has some pictures of John Stamos and Gabrielle Union during their respective appearances on Rachael Ray's talk show. Mike at TV Food Fan tells us what he thinks about Rachael Ray's talk show ratings. And thanks for the compliments, Mike! I was having a very bad blogging day when I read Mike's post, so I really appreciated his kind words. You can check out the red dress that Rachael wore to the Heart Truth Fashion show at the Reagan Presidential Library. The dresses worn by Rachael and five others will be on display through May 13 along with red dresses worn by many First Ladies.